Those of you who have read some of my contributions to News and Views over the years have seen me talk about one of my other passions; coaching my son’s coach-pitch baseball team. It’s still spring training, and we have yet to discover our real potential, but who knows, maybe this is the year I get to write about a championship! If you still haven't discovered NAAE's Communities of Practice, spend five minutes RIGHT NOW and take a look. It's a professional networking site just for ag teachers. 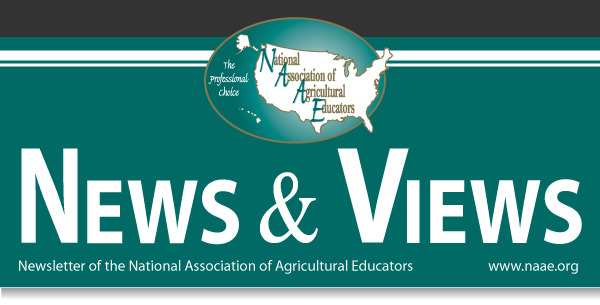 CoP's more than 1500 members (all of whom are agricultural educators) are continually posting ideas, lesson plans, and discussing things of interest and import. It's by ag teachers, for ag teachers, and it's FREE. Do you use and love CoP? We need volunteers to give presentations or workshops about Communities of Practice at their summer meetings. Whether it's your state ag teacher's meeting or another professional get-together, we need help spreading the word. We'll provide materials, you provide the manpower. Interested? email Julie Fritsch, NAAE Communications/Marketing Coordinator.